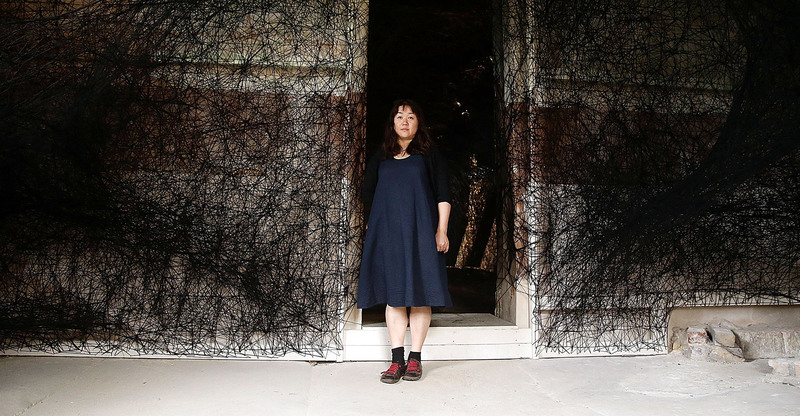 Ms. Shiota, do you choose your art form, or does the form choose you? Connection is part of our existence, we cannot exist without feeling connected to someone or something! That is why I stopped drawing and painting because I was not comfortable with this art form. Painting as an art form has so much history, but I had the feeling that it was not my own material; it does not belong to my history. I wanted to find the meaning of art, and I knew if I continue to paint, I would only create art for art. Apparently when you were questioning your kinship with painting, you had a dream where you were inside a two-dimensional painting. In the dream, I was moving inside of a painting, everything was grey, black and white. It was very difficult to breath because everything was covered in oil paint. The dream ended up inspiring a performance called Becoming Painting, which was much more expressive. I used red enamel paint and poured it over my whole body. It burned and colored my skin, I had to cut my hair which was red for months; enamel is a very toxic paint. I tried to manifest the dream in the performance. I wanted to be part of an artwork just as I had felt in the dream. Were the feelings you felt during the performance the same as the ones you felt in the dream? No, it felt very different. In the dream everything was very abstract, during the performance I had much more control, I was not scared, it felt liberating creating art with my body. It was a liberation from art as a skillful practice. Have other dreams inspired your art? 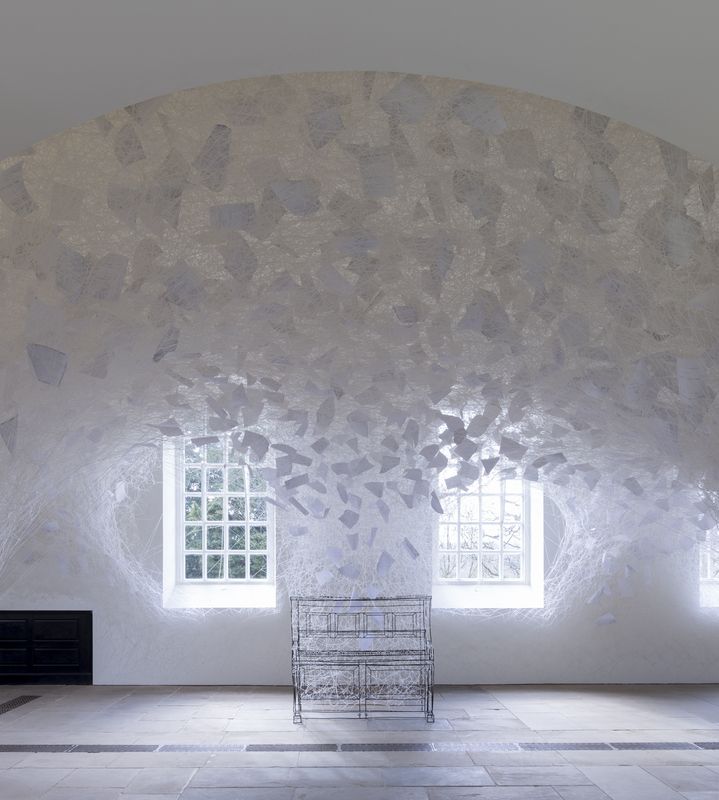 The Taoist parable The Butterfly Dream, which questions reality, has also been an inspiration for my installation During Sleep. The story involves a man dreaming of being a butterfly, but when he wakes up he is not sure if he is a man who dreamt of being a butterfly or a butterfly dreaming of being a man. He does not know his own sense of real life anymore. I believe sleeping and dreaming is an important foundation for our sense of reality and existence. 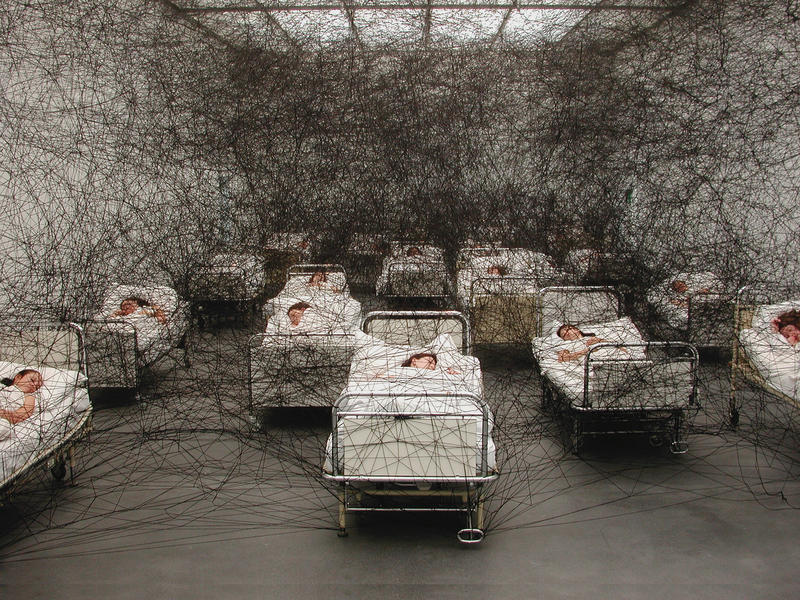 Was the use of thread in your art installations also inspired by a dream? Threads allow me to explore space, piling up layer after layer creates a surface like the night sky which gradually expands into the universe. I began using white thread, for example, because I wanted to experiment with something new. I wanted to create something unfamiliar. It was for a project at the beginning of 2017, and because I had never worked with white yarn before, it felt strange, but now it is a part of my art. Before that you were working solely with red and black, right? Yes. 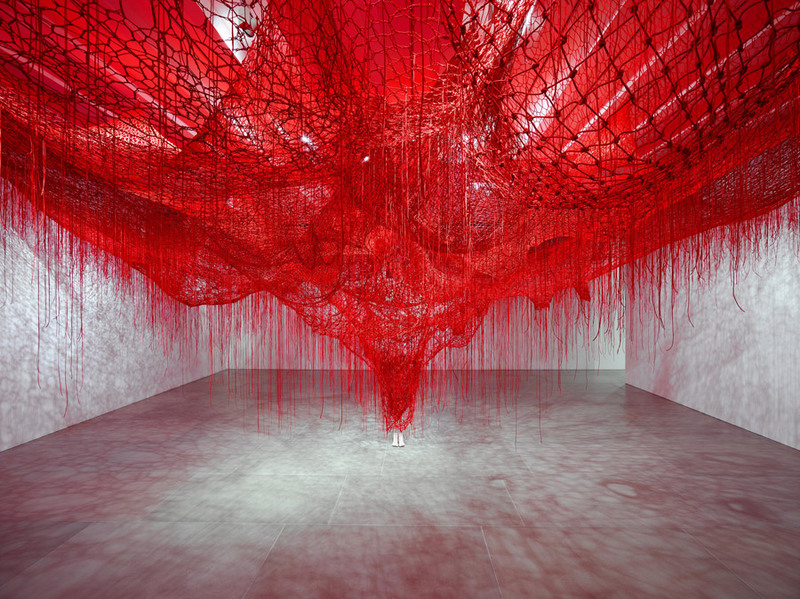 I use red yarn because it resembles blood, the body and human relationships. White yarn is pure — in Japan the color is connected to death, it is a blank space, it is timeless. 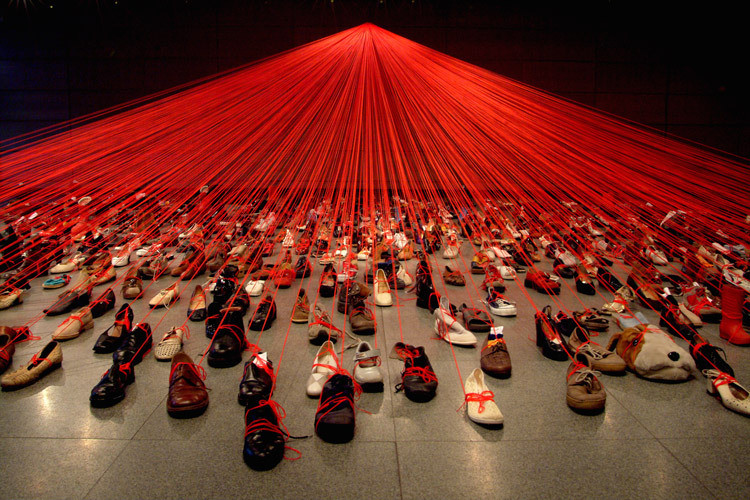 Do you experience the hanging of threads as cathartic? I have to make art in space, and I am never sure how it will look like in the end. Other artists create art in the studio, a space that is familiar to them, but I create artwork in the museum or a gallery space. So it never feels cathartic… It is rather the opposite; I often feel a struggle. Georg Baselitz says that all good art comes from misery, never from anything positive. I make my art not as a kind of therapy for internal anxiety, since in my case the fear is necessary to actually make art. I create out of emotion. Everyone has a universe inside of them and I think it is our goal to connect our inner universe with the outside universe. This is something I try to make sense of with my work. I create to understand my emotions and myself and to connect with others. Is this why your installations are often grounded by physical items that belong to strangers, like shoes or beds? Yes, in the past I have used mundane objects — you mentioned shoes and beds, but also things like keys — because they emit human traces. 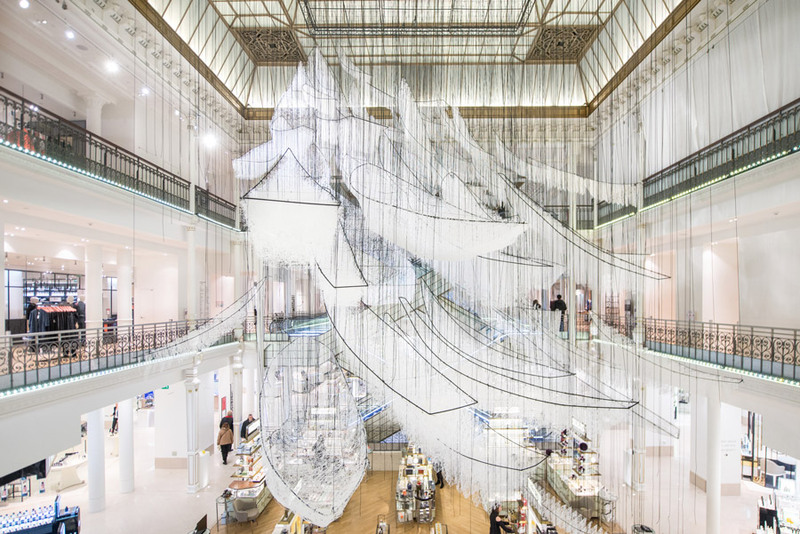 In fact, all of my installations before Me Somewhere Else incorporated people that I did not know but who I wanted to connect with. I believe the objects that surround us also accumulate memory. How do you tap into those memories with your work? Memory is something we cannot touch or see, but it is very strong… For instance, for my installation Dialogue from DNA, I was collecting shoes and asked the owners to add notes, explaining their memories connected with the shoes: a first date, weddings, a trip to Europe, a daughter’s piano concert. When I was reading these personal notes of these strangers, I could see their existence within the object. I connected all these feelings and memories with the string to one single point. But Me Somewhere Else is much more personal for me because I used a cast of my own feet. Did using the cast of your own feet ground you to the project more? I referred to my own body and my own experiences, I was questioning how my body is connected to the universe, and where does my consciousness go when my body is gone? I always thought that when death takes my body that I will be gone, I won’t exist anymore. But now, I know that my mind and my body act separate from another. I am not only my body, but also my consciousness. My feet touch the ground and I am connected to the world, but when my body is gone, my consciousness remains somewhere else.